Section 498a of the Indian penal code makes it an offence for a husband or his family to subject his wife to cruelty or harassment. Hridaya-Nest of Family Harmony is a Men's Rights organisation that claims that Section 498a is frequently abused, with false accusations being made against men. "National Crime Records Bureau statistics reveal more incidences of suicide by married men than by married women. In 2012 approximately 64,000 married men committed suicide vis-a-vis 32,000 married women," says DS Rao, president of Hridaya-Nest of Family Harmony, an NGO, quoting a survey by it. Supreme court issues new guidelines to prevent misuse of section 498A. The Dangerous, False Myth That Women Routinely Misuse Domestic Cruelty Laws. Were there 64,000 deaths by suicide of married Indian men in 2012 after Section 498a claims? There were a total of 79,773 deaths by suicide of Indian men in 2012, in which 63,349 were due to non-illness, regardless of false claims of Section 498a or not. 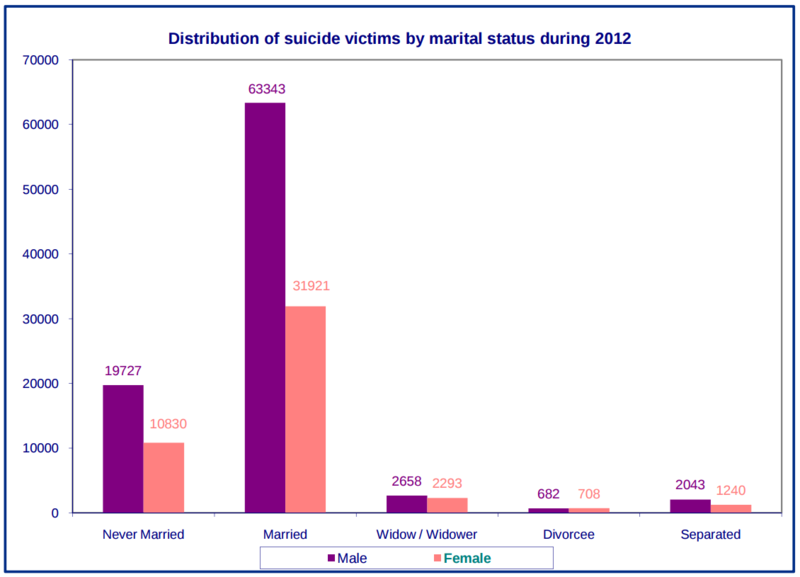 For suicide victims by marital status during 2012, refer to user45170's answer: there were 63,343 deaths by suicide of married Indian men in 2012, regardless of false claims of Section 498a or not. According to Open Government Data (OGD) Platform India for "State/UT-wise distribution of suicides by causes during 2001-2012" provided by National Crime Records Bureau (NCRB), there were a total of 79,773 deaths by suicide of Indian men in 2012, composed of 63,349 due to non-illness and 16,424 due to illness. 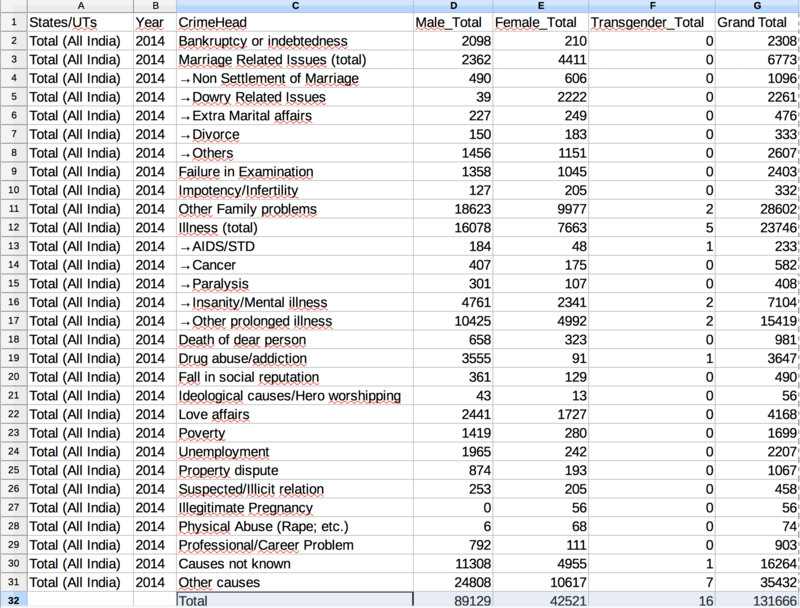 The data only includes the cause of the death and is categorized by age and gender. It doesn't specify marriage status, nor a specific cause for false charges. Note: modification to the source file was done for a more convenient reading purpose. It seems highly unlikely. The person making the claim claims there are about 64,000 suicides every year, "due to alleged misuse of section 498a of IPC against them." He then goes on to quote the national statistics, showing that there were a grand total of 64,000 suicides by married men in 2012 (along with 32,000 by married women). This would mean that each and every suicide by married men were because of this, and that there wasn't a single married man who took their own life for any other reason, at all. So, 32,000 married women found reason enough to take their own life not related to false charges, but not a single man did? The person making the claim also offers no validation for the claim that they all had 498a charges against them. Wikipedia has a page about suicide in India. 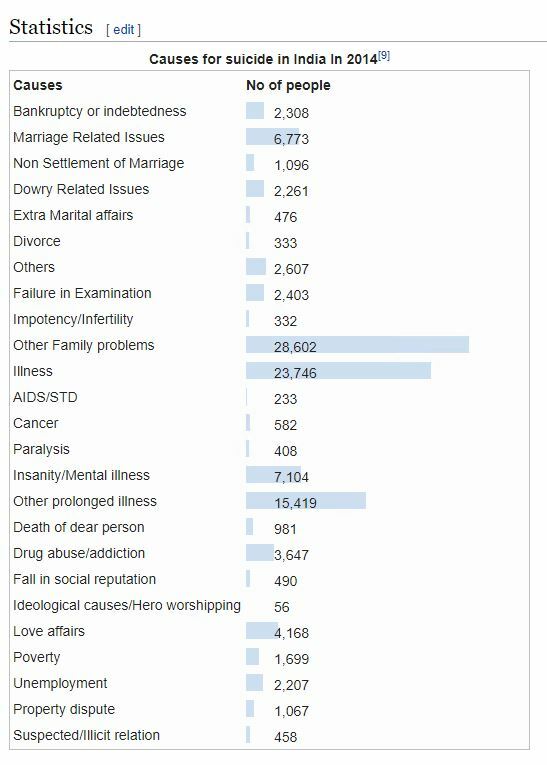 In it, it has a list of reasons for suicides in 2014, taken from government statistics. Even if we assume that all the women and all the non-married people were killing themselves for reason not related to marriage, and attribute all of the general "Other" and "Other Family Problem," and unaccounted-for suicides (no reason given/uncategorized = 27,000 or so) and every other category that might, in our wildest imaginings to fall into that category, there is not enough statistical room to support this claim. There were 88,453 suicides of males in India in 2012, regardless of 498-A accusations, false or otherwise. I have no data on the number of 498-A cases. The following is only with regards to the number of suicide victims. The 63,349 figure in Andrew's answer excludes West Bengal, and suicides caused by illness. Not the answer you're looking for? Browse other questions tagged law india .